The truth is that God doesn’t need our money, but He knows that our orientation toward money reflects our obedience to the Lordship of Christ and how well we grasp that he is the source of all we have. As followers of Christ, our goal in life is not gaining power, possession, or prestige for ourselves. We exist, along with the entire body of Christ, to fulfill the Great Commission until Christ’s return. Generosity offers one of the most powerful ways for us to leverage the blessings of God for the advancement of the Kingdom. Best of all, when the church acts with generosity to serve others, it is a clear picture of Christ, who generously gave his life and all He had on the cross that we might find life forever. Financial hardship has a way of breaking down the walls that separate us, even in the church. The sudden loss of wealth and security reminds people that our stated net worth on paper—our value in the eyes of the world—can change at any moment. During the last recession, people began to question what really mattered in life and think about what was of lasting value. Individuals that had placed their hope in the markets began to recognize that paper is really nothing more than paper—it has no lasting value. Two people, who might have been separated by the divide of wealth between homelessness and luxury, now found themselves in the same pew, seeking the same answers: Where are you, God? What is your plan for me? Unfortunately, history shows us that the insights we gain in these moments of clarity, when the divisions created by money evaporate long enough to reveal what is truly valuable and how much we have in common with one another, fade away all too soon. How can we prevent that from happening as our world moves toward economic recovery? How can we learn to retain the insights from the lean years when the years of plenty return? The church has a unique message for times of economic uncertainty. Jesus provides us with an alternative approach to money that celebrates the sharing of our resources with one another. What we are describing is not an economic model that forces people to share their resources with another, nor is it a political agenda. Instead of being motivated by outside pressure, we believe that the church must begin to challenge people to behave in ways that are consistent with what they profess to believe. Why? Because the world—the lost people all around us—is watching and paying attention to how we respond in times of trial and testing. As Jesus reminds us in Matthew 5:14-16: ““You are the light of the world. A town built on a hill cannot be hidden.” When we act in ways that are consistent with our commitment to Christ, a watching world notices. We cannot hide who we really are, and generosity reveals that our faith is genuine and true. As we live with generosity before a watching world, skeptics and cynics will find it nearly impossible to find fault with genuine acts of generosity that demonstrate that our hearts have been set free from our love of money and things. When we give for the benefit of the Kingdom, to serve others in love without an expectation of something in return, that gives them something worth talking about. Far from being a stumbling block to people, money can actually be a conduit, a connecting bridge to people outside the church. Generosity is the new evangelism. 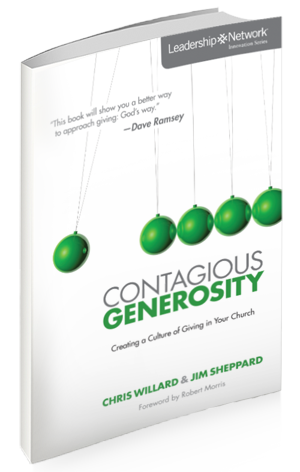 Excerpted from “Contagious Generosity” by Jim Sheppard & Chris Willard, Zondervan, 2012. Generosity: Why Should I Care? Given the challenges that many individuals, families, and churches are now facing in the aftermath of the global economic crisis that began in late 2008, the topic of generosity is more timely than ever before. When our security is threatened due to a job loss or the possibility of scarcity, we are tempted to lock up what we have stored away. But we have seen God work in amazing ways as churches and individuals have chosen the opposite approach. Instead of locking away their resources in fear, they have chosen to share what they have with those in need—and their generous giving has drawn attention. In some cases, these faith communities received local and national media coverage. Even though their own financial security was uncertain, some churches gave their surplus budget away to meet the desperate needs of their communities. This act of generosity, motivated by a love for God, earned the church credibility and made an impact on the community, changing the lives of those who gave and those who received. The financial crisis became a bridge for the church to communicate the message of a generous God to a struggling world. Churches, in ways they had never done before, began to talk about money, teaching their people how to gain freedom from debt and emphasizing new disciplines of sacrificial giving. Generosity, when it flows naturally from the heart of a church community, will be contagious. It expresses, in practical and powerful ways, the message that is at the core of our faith: God gave his only Son to us, that we might have life. Generous churches believe that they have been given everything, and as an expression of their love for God, they share what they have with one another and with those in need. Money is perhaps the most measurable aspect of our faith. How we spend our money directly reflects our commitment to our own faith—if we practice what we say we believe. But that same standard should also be applied to our churches, corporately. How churches use and spend the resources that God has entrusted to them serves as a witness to the culture of the church community. It is a clear reflection of what the church values and what it believes. A church that does not reflect a generous spirit will struggle to grow and disciple generous givers. Generosity is one of the most significant movements within the evangelical community, but it is also a topic that is highly debated among Christian leaders. How we understand its role within the life of the believer—and better, within the life of the Christian communities in which we do life together will perhaps say more about our faith and our understanding of the gospel than any other single facet of our faith. Let’s begin with a working definition of generosity. Generosity is at its core a lifestyle—a lifestyle in which we share all that we have, are, or will ever become as a demonstration of God’s love and a response to God’s grace. It is not enough for the church to talk about generosity, nor is it enough for individual Christians to simply commit to being generous. What makes generosity a real and powerful witness to God’s love is our actions. Generosity flows from an understanding that all we have, are, or will ever become is not ours to possess and it results in practically sharing what we’ve been given with others for the advancement of the kingdom and the glory of God. Generosity embraces a Biblical understanding of stewardship. That is: (1) God is the owner of everything; (2) What we have has been given to us by God; (3) The resources we possess are assets to be invested in the Kingdom. Before we can be generous, we must understand what it means to be a steward, recognizing that what we have is not ours to own and confessing that “Jesus is Lord” over our money, possessions, positions of authority and talents. You can’t be generous without an appropriate discipline of biblical stewardship, and biblical stewardship demands generosity. The free gift of the grace of God shapes our faith and leads to the conviction that all that we have—our time, talent, treasure, and testimony—is something that we have been given for a purpose. We cannot separate our acceptance of God’s grace from the practice of generosity. We are generous because God was first generous with us, freely giving his life for our sake. As followers of Christ, we seek to imitate the one who gave himself for us (1 Thessalonians 1:6; 2:14). Stewardship is more than an obligation. It’s an opportunity—to witness to the reckless nature of God who gives the free gift of salvation by grace to all who will receive it. Generosity is the fullest expression of the life of a steward, one who has been given a gift, a gift that must be used wisely and for a purpose, bringing glory to God. Nobody (new) goes there any more . It’s too crowded. We covered that in part 1 of this post. Space affects momentum. Make no mistake about it. Your church has grown and now you are at the point that the lack of space is about to affect the momentum of your plant. It is not the time to look at another temporary space. It is time to consider a permanent home for the church. As I have watched planters and their leadership teams wrestle with this issue, I see three common mistakes – too small, too big, too late. Let’s consider the implications of each scenario. Too small: Not very many church plants make this mistake, but when they do, it becomes evident almost immediately. Generally, this one occurs because the church moves too soon and does not have the critical mass it needs to be able to afford the right space. The church becomes impatient with the temporary location and doing portable church. The result is a rushed decision to move to a permanent home followed by the reality that the church cannot afford what it really needs. Because the space is too small, the momentum of the church stalls and a whole new set of challenges sets in. Too big: This is the one that far too many church plants stumble on. Growth is intoxicating. It is too easy to think that the growth rate the church is experiencing will continue for a while to come. In thinking through the decision, church leaders get carried away with having enough space and, in the process, inadvertently overestimate the financial capacity of the church. Too much mortgage and too much building to maintain. What happens then is that the need to feed the “building monster” begins to drive way too many discussions and decisions in the life of the church. At a time when the church has plenty of space and needs to grow, financial decisions restrict ministry. It doesn’t take long before this becomes a drag on the church. Too late: This is the one that catches a lot of church plants by surprise. The church has been in temporary space for quite a while. They see the growth and momentum of the church, but fail to take into account how long it will be before they need more space. Then, all of a sudden, it is time to make a move to permanent space. Not just time, but past time. The church has used up all its weekend options and there is still not enough space. If this happens, it won’t take long before momentum stalls – right at the moment the church has been looking forward to for so long. Moving to a permanent home. Three common mistakes that are all too easy to make. That’s why I believe that moving to a permanent home is the most critical decision a church plant will make after it becomes viable. It affects the church in many ways and for many years. Get this one right and your church plant will have a huge ministry impact for a long time to come! You have to think it through. You have to consider the magnitude and make sure you have the resources (Luke 14:28-30). But most important of all, you have to pray diligently for God’s leading. This is a critical decision, but it is God’s church. He has a plan for it. Find that plan and you will have made the best decision! Church planting is hard. If you’re a planter, I don’t need to tell you that. In terms of experience, you could tell me a lot more than I can tell you. My perspective is from someone who sees a lot of planters attempt to launch a church. There are so many important decisions along the way – when you’re getting started, when you’re raising initial support, when you’re deciding on the launch team, when you’re looking for a place to launch and so many more. Recently, I had a conversation with a church planter that reminded me of the most critical decision most church plants will ever make. You’ve raised initial support and launched successfully. You’ve been in your initial location doing the portable church thing for a while. People are serving and a sense of community has begun to permeate the fellowship of the people who are calling the church home. The church has established momentum and has grown. In fact, it has grown so much the church now has to start thinking about a new home. Maybe even a permanent home. I know it is hard to say any one decision is more critical than another. However, from my perspective, after a church is launched and becomes viable, no decision is more critical than this one – the decision to move from temporary space to a permanent home. Let me explain. Space affects momentum. Make no mistake about it. The very reason you would even consider moving is because, if you stay where you are too long, it will affect momentum. The scary thing about this decision is that you have to make it before your capacity reaches the point of actually needing it. Waiting too long to make the call to move can be costly. The former NY Yankee catcher Yogi Berra gets credited with a lot of sayings that seem like they don’t make sense. But one of them, I completely understand. He said it about a restaurant in St. Louis, but he could have said it about a church. He said, “Nobody goes there any more. It’s too crowded.” At first, you’re thinking “Huh?” It sounds like a contradiction but it’s absolutely true. Once people decide your church is too crowded, momentum will stall. Nobody (new) goes there any more – it’s too crowded. As a church planter, you didn’t get this far only to let that happen. In the second part of this post, I’ll explain in more detail and cover the implications of the decision to move to a permanent home. If there is one behavior that constantly surprises people, it is the act of generosity. Many of us travel a lot. We tip hotel staff and even help people out that we meet along the way. Sometimes we choose to do this well beyond what we are “expected” to do. Have you ever noticed what happens when you offer a gratuity well beyond the norm? If you haven’t, you should try it some time so you can see what it does to you and to the one receiving it. Or, here’s another one. Have you ever been in the drive through lane at a fast food restaurant and when you get to the window to pay, you find that the person in front of you paid for your meal? It happened to me one day and my instinctive reaction was to pay for the person behind me. Yes, generosity is contagious. We don’t do this because we have been blessed with an abundance of financial resources. Nor do we do it because we want to feel better about ourselves. We love to give because giving is an opportunity to pass along the joy of our faith in Christ. We share with others in a way that has been modeled for us by other believers and by the God who gave himself for us. The greatest way to change the world, Gandhi once said, is to be the change we wish to see in the world. This definition gets at one of the key reasons why generosity is contagious. When we are generous, it creates a transferable experience that leaves both the giver and the recipient different than they were before something was given. We can stand on the sidelines and watch other people giving generously and be inspired by their actions. But when we ourselves choose to give freely to others, not only is monetary currency exchanged, there is an intangible currency that is passed from recipient to giver, a currency so powerful that it becomes contagious, inspiring the desire to give in both the one giving and the one receiving. When a church operates out of the mindset that there are limited resources available for the work of ministry, it operates at less than its full capacity. It places limits on the dreams of the church and its people. It restricts the ability of those in its midst to think beyond what is currently believed to be possible. It minimizes ministry potential to the limits of available resources. This creates a “scarcity” mindset, rooted in a fear that one day we will run eventually out of resources. Worse, when churches operate with this sense of limited resources, their behavior trickles down to the person in the pew. During recent times of recession, I have heard many leaders talk about “holding on” to what they had. Sadly, some congregations embrace their financial fears and stifle their faith. Instead of asking what God might do in the midst of challenging economic circumstances and dreaming up new opportunities to proclaim Christ, they limited their dreams—and their potential for spiritual growth and community impact. Churches that practice a contagious level of generosity don’t see or acknowledge limits. They begin with a foundational belief that we serve an all-powerful, all-knowing, and always-present God who creates resources when they don’t exist. Contagious giving is rooted in faith and it remains open to the impossible. The paramount question is not, “what do we need to cut to survive?” but “what is God calling us to do next?” If the God we serve is not bound by our human limitations, then he certainly isn’t limited by our currency—or lack of it! We must remember that when God calls his people to do something, he has already equipped us with the resources we need to do what he asks of us — and that means depending on him and growing in our faith. I was on vacation last week so I did not get to see The Great Recovery launch event live. I watched it this morning and I am blown away. If you thought you had seen Dave Ramsey on fire before, wait till you see him in this event. If you did not see it live, you can view it here: http://www.thegreatrecovery.com/live. I love the message of The Great Recovery. As I write this post, the politicians in Washington — all sides — are debating how to solve the budget and debt ceiling issues. I watched only briefly last night because I just cannot listen to any more “blah, blah, blah” political posturing from Republican and Democrat alike without proposing a viable solution. I’m just sick of it — all talk, no real action. Dave Ramsey, on the other hand, is proposing a real, workable solution — The Great Recovery. Restoring the hope of the world as embodied in the church. Living lives based on Biblical values as it relates to our finances. Restoring America one life at a time. Having the courage to face our challenges and work our way out not just wish our way out. Putting our hope in God as our provider, not Washington, DC. I am really grateful God has raised up a courageous, faithful man like Dave Ramsey to speak up and bring us this message. Count me in. It’s that simple. I am joining The Great Recovery movement. Join me. You’ll be glad you did! …because of the way they are. I have seen it any number of times but it really crystallized for me in the last few days. Organizations, including and especially churches, do not end up the way they are by accident. It happens on purpose. The excellent church continually finds ways to do things better and reach more people. Other churches struggle just to maintain whatever they have and some do not even do that. Why does the excellent organization seem to make the right call almost every time and the mediocre entity seem to seldom make the right call? The people, theology, thinking and systems all contribute to it. If nothing changes, nothing changes. The entity becomes stale and replicates itself over and over. On the other hand, the excellent entity keeps itself fresh and continually reinvents itself to adapt to changing circumstances. Whatever your church or organization is — for better or for worse — will replicate itself internally until there is a significant change of some kind. You could peg it all on leadership and, to some extent, that would be true. But leadership alone is not the issue. I could show you churches who have had several leaders in recent years and the result of the church is the same. That begs the question of culture. Yes, that is probably an issue, too, in a number of cases. Culture matters more than vision. Bad culture trumps great vision every time. But there is more. Churches make choices. Remaining the same is a choice for the most part. Challenging the status quo to effect change for the better is a choice, too. For there to be change, something has to change. Sometimes, the change that is necessary is “major surgery” of some kind. More often, it is something not so major. Perhaps just a change of perspective for the senior leader or a team of leaders. Conferences are good and can provide a spark. Consultants can provide an additional perspective. But real change is more grass roots than that. You have to see it in action to be persuaded it will really work. There are any number of ways you could do that, but here is one suggestion. Find a church that is like what you want your church to become — missional, evangelistic, global missions, community outreach, worship and arts. Whatever it is you want to see change in your church, find a church who does that well and go spend time with them. Better yet, if they are local, arrange to swap places with the senior leader for a couple of days. In other words, you go see what makes their church tick and vice versa. Then sit with each other and share your observations. You’d be surprised how illuminating this can be. Change does not happen all of a sudden. It takes time. But the decision to change can happen right now. For Christ’s sake, if your church is stuck, find a way to get unstuck. You don’t have to be the way you are. You can effect change. Organizations are the way they are — because of the way they are. Should The Jobless Tithe On Unemployment Benefits? The Village Green section of Christianity Today magazine which presents answers from leading Christians to pressing questions. CTI asked me to contribute to this question for their March 2011 edition. Here is what I said. Perhaps the greatest tragedy of the recent economic meltdown is long-term unemployment, a reality in which many thought they would never find themselves. For the first time, hardworking, well-intentioned individuals are paying their bills with the income they receive from government checks instead of their profession or trade. During these tough times, it is easy for churchgoing, typically responsible Christians to fall off the radar as they deal with the shame of being unable to provide for themselves or their families. In these times, it is more important than ever that Christians seek out pastors, leaders, and friends who can provide loving community and accountability to be faithful stewards in times of hardship. Scripture does not speak directly to the topic of tithing on an income that is not your own, so I am reluctant to say firmly, “Yes, give this much.” But the Bible has much to say on the subject of generosity and gratitude. There are four questions church leaders and others can ask to help someone struggling with tithing on their unemployment benefits. • Do you see unemployment benefits as part of God’s provision for your life? • Are you continuing to practice generosity in every area: time, talent, and treasure? • How does giving a portion of your unemployment benefits differ from giving apportion of your “employed” benefits? • Would giving a portion of your unemployment benefits demonstrate gratitude that God is providing for you in this season of your life? Generosity is a condition of the heart. As resources come into the hands of a generous person, he or she can’t help giving them away. It’s second nature. A lifestyle of generosity should not stop when times are hard. If anything, tithing when income is low reinforces gratitude and trust, as it reminds the giver that God can use even the smallest gift to accomplish his will. It also reminds me that I am always dependent on God for my sustenance, whether I have savings in the bank and a regular paycheck or not. This is where Christian community should be most apparent, in encouraging and supporting each other to live out generosity in tough times. I’m not going to argue that a specific percentage be given, just as I wouldn’t in responding to an employed individual. That is between the individual and God. Living a generous lifestyle is not an obligation but rather an opportunity. It is something I get to do for God’s kingdom, not something I have to do. 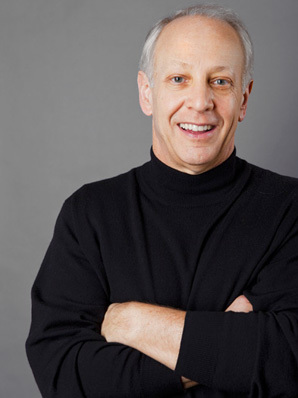 Allen Walworth, co-owner of Generis with Jim Sheppard, is transitioning his share of Generis to Brad Leeper, who becomes President and Principal. Brad joined Generis in 2001 and quickly became adept at working with churches in their generosity and stewardship matters. In his 10 years with the firm, he has established himself as one of the top stewardship and generosity consultants in America. Allen will remain as a consultant working with church and ministry clients and will continue as part of the management team of Generis.